"Get Lucky" is a song by French house music duo Daft Punk, featuring Pharrell Williams and co-written by the duo, Williams, and Nile Rodgers. It is the lead single from Daft Punk's fourth studio album, Random Access Memories (2013). 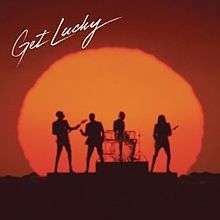 Before its release as a single, "Get Lucky" was featured in television advertisements broadcast during Saturday Night Live, after which Rodgers and Williams announced their involvement in the track. Small excerpts also appear throughout the promotional video series The Collaborators. "Get Lucky" is a disco song with lyrics that, according to Williams, are about the fortune of connecting with someone, as well as sexual chemistry. After it leaked in mid-April, the single was released as a digital download on 19 April 2013. "Get Lucky" has since received acclaim from critics, and has spawned numerous cover versions and parodies. The single reached the top ten in the music charts of over 32 countries, and has sold more than 9.3 million copies, making it one of the best-selling songs of all time. The song won awards for Record of the Year and Best Pop Duo/Group Performance at the 56th Annual Grammy Awards, during which Stevie Wonder joined Daft Punk, Williams and Rodgers onstage to perform the song. "Get Lucky" was completed over the course of approximately 18 months. Daft Punk first met Rodgers at a listening party in New York City for the duo's 1997 debut album Homework, and became friends thereafter. The duo acknowledged Chic's influence in the song "Around the World" and had great respect for Rodgers. He noted however that a series of near misses and scheduling conflicts had delayed their chance of collaborating. The duo eventually invited Rodgers to the Random Access Memories sessions at Electric Lady Studios in New York City. This coincidentally was the studio where the first Chic single had been recorded, in the neighborhood in which Rodgers grew up. After listening to Daft Punk's demo of what would become "Get Lucky", Rodgers asked that all of the elements except the drum track be muted so that he could create a suitable guitar part; he recalled that he experimented until the duo were visibly pleased. Once he completed his contribution, Daft Punk re-recorded the bass part with Nathan East to fit Rodgers' performance. Rodgers further elaborated that, "Everybody else wound up re-playing to me". Mixer and engineer Mick Guzauski recalled that the rhythm guitar fit easily into the production: "I experimented with balancing and other positioning, and working other stuff around it. He didn’t have to be processed – Nile just sounded great the way he is." The song as it appears on the album also features a synthesizer part by Daft Punk, keyboards by Chris Caswell and additional guitar performed by Paul Jackson, Jr.
Williams first heard about the project from Daft Punk "at a Madonna party" and offered his services for a collaboration. He had joked that, "If you just want me to play tambourine, I'll do it." The duo and Williams later met in Paris, where he shared some of his own material; Williams explained that he had been inspired by Rodgers, not knowing that Daft Punk had coincidentally been recording with him. Williams noted that the duo adopted a perfectionist approach during the recording of the vocals for "Get Lucky", as he was asked to perform several takes and multiple instances of specific phrases. As a member of The Neptunes production team, Williams had previously provided a remix of "Harder, Better, Faster, Stronger" that appeared on the 2003 album Daft Club. Daft Punk also served as co-writers and producers for the 2010 single "Hypnotize U" by N.E.R.D, Williams' band. "Get Lucky" features vocals by Pharrell Williams and vocoders performed by Daft Punk. 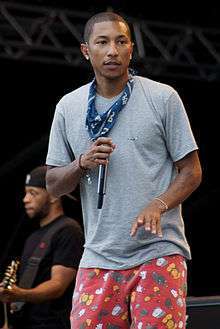 Pharrell Williams performed vocals for "Get Lucky". "Get Lucky" is composed in the key of F-sharp minor. It follows the chord progression of Bm7–D–F♯m7–E. The song runs at common time with a tempo of 116 BPM. Prior to Rodgers' involvement, the song existed in rough form that centered on Wurlitzer electric piano with Omar Hakim on drums and East performing bass guitar. Rodgers' presence on the completed song consists of two layered guitar parts: One layer features rhythm guitaring while the other is a melodic riff. Rodgers considered the minimal number of layers to be a characteristic of early Chic recordings due to the technical production limitations his band had at the time. Hakim demonstrated that the hi-hat pattern of "Get Lucky" was devised as a way to provide variety whilst maintaining a minimal four on the floor rhythm. Williams noted that upon returning to the United States after his vocals were recorded, he had "forgotten everything" regarding the composition of "Get Lucky"; he attributed this to jet lag, but jokingly wondered if Daft Punk had tampered with his memory. The duo responded by explaining that Williams's lyrics and performance had come about in a very spontaneous way, which was the likely reason he had trouble recalling the song. Upon hearing "Get Lucky" later in its developed form, Williams remarked that the music evoked the sense of being on an exotic island during a "peachy color[ed]" sunrise. He elaborated that the title does not simply refer to a sexual act, but to the fortune of meeting with and immediately connecting to someone. Williams' vocal and Daft Punk's vocoder performance jointly span three octaves: D2-D5. Friend and occasional collaborator Chilly Gonzales also observed that Daft Punk had previously used the chord progression in "Around the World" and that the verse, bridge and chorus of "Get Lucky" are largely defined by the melodic phrasing of the vocal. The duo noted that their own ten-minute remix of "Get Lucky" is more akin to extended mixes of the 1970s and 80s, rather than a conventional reworking. At the 56th Annual Grammy Awards ceremony, Daft Punk appeared on stage with Rodgers, Williams, and Stevie Wonder alongside Random Access Memories session players Hakim, Caswell and Jackson, Jr. Together they performed a medley of "Get Lucky", "Le Freak", "Harder, Better, Faster, Stronger", "Another Star", "Lose Yourself to Dance", and "Around the World". "Get Lucky" was first publicly revealed via two 15-second television advertisements on Saturday Night Live. Rodgers announced his contribution to the song shortly afterward, and noted that various fan remixes of the clips have appeared online since the airing. The third trailer, which was shown at the Coachella Valley Music and Arts Festival, officially announced Williams's involvement in the song and features Daft Punk, Rodgers, and Williams performing together. The promotional web series The Collaborators featured excerpts of "Get Lucky", culminating in the Williams-focused episode in which the song was first referred to by name. Days prior to the single release, the song had been leaked and broadcast on various radio stations. In the United Kingdom the song joined the playlists of BBC Radio 1, BBC Radio 2 and BBC Radio 6 Music. Upon the official release, Williams performed "Get Lucky" live for the first time at an HTC One launch party in Brooklyn. Since the release of "Get Lucky", Daft Punk have encouraged the reworking of their latest musical works and a series of "Get Lucky" remixes have been released from acts such as PV Nova and TBM. A 12" vinyl single was released on 16 July 2013, featuring a ten-minute remix by Daft Punk, the album version and the radio edit. The Daft Punk remix was first released on Spotify and, as of June 27, 2013, was streamed 64 million times. In late June 2013, an unofficial remix album Random Access Memories Memories was released by Darkside (under the pseudonym Daftside), the musical partnership of producer Nicolas Jaar and musician Dave Harrington. Jaar has previously released remixes of Grizzly Bear and Brian Eno. Rodgers stated in an interview with The Guardian that a video for "Get Lucky" was shot in March 2013 that is distinct from the Coachella trailer, featuring a group of dancing extras. In an interview with French music magazine Rock & Folk in April however, Daft Punk stated that a music video was not part of the immediate promotional plans for the single. A trailer for the official "Get Lucky" remix was released via the Columbia Records YouTube channel on 25 June 2013, featuring a group of dancers. Rodgers later stated that video footage for "Lose Yourself to Dance" had been shot simultaneously with footage for "Get Lucky". Daft Punk were scheduled to appear on the August 6 episode of The Colbert Report to promote Random Access Memories, but were unable to do so because of contractual obligations regarding the duo's future appearance at the 2013 MTV Video Music Awards. According to Stephen Colbert, Daft Punk were unaware of any exclusivity agreement and were halted by MTV executives the morning prior to the taping. Colbert nevertheless performed a pre-recorded elaborate dance number to "Get Lucky" featuring appearances from Hugh Laurie, Jeff Bridges, Jimmy Fallon, The Rockettes, Bryan Cranston, Jon Stewart, Matt Damon, Charlie Rose and Henry Kissinger. Earlier on the program, Colbert had declared that the song was "The Song of the Summer of the Century". "Get Lucky" is a featured song in the video game Just Dance 2014 and is also included is on the video game soundtrack for NBA 2K14. A remix of the song was also used in the dance number choreographed and performed by the 2013 nominees of the Primetime Emmy Award for Outstanding Choreography during the 65th Primetime Emmy Awards. The song was used in the 2014 films Boyhood and The Inbetweeners 2 and advertisements for the ITV2 reality TV show The Only Way is Essex. The song was also used in The Simpsons episode "Bull-E". "Get Lucky" received widespread acclaim from media outlets and music critics. Michael Cragg from The Guardian said the song "eschews the crunching electronics of their last album and the vocoder-lead [sic] future-disco of Discovery", and it was the "best thing Pharrell Williams has been involved with for a long time". Pitchfork listed "Get Lucky" as a Best New Track, stating that the song's "real elegance lies in the hands of Nile Rodgers". Lewis Corner from Digital Spy gave the single 5 stars and said although Daft Punk's "creative methods may be unorthodox, the final result is a legal rush we can all enjoy". BBC Radio 1 host Annie Mac played "Get Lucky" on the day of its release, and gave it a positive review. She remarked that Daft Punk are not making electronic dance music, but rather "real music to dance to". Music critic Sasha Frere-Jones of The New Yorker wrote that Rodgers' performance in the song was "as close to magic as pop comes." Rolling Stone reviewer Will Hermes giving the song a four-star rating out of five, described it as "an old-school disco jam" and called it "formidable". Amy Sciarretto of PopCrush also welcomed the song, she called it an "intoxicating track" and wrote it "represents all that’s right with electronic music." Fellow musicians have also publicly commented on the song. British DJ and producer Norman Cook (better known as Fatboy Slim) expressed high praise for the song and stated in an interview with the Daily Star: "I'm so impressed by them. It's a breath of fresh old-skool air". Cook had felt that recent popular electronic dance music had started to become bland and that "Daft Punk have given us [electronic musicians] all a kick up the arse." The song broke records with the highest number of plays of any song in a single day on music streaming application Spotify. British journalist Caitlin Moran has speculated that the song's attractiveness is due to its combination of minor chords and regular disco-type "up" beats throughout the song, with the former creating an unresolved feeling. "Get Lucky" was nominated for Best Song of the Summer at the 2013 MTV Video Music Awards. The song received awards for both Best Pop Duo/Group Performance and Record of the Year at the 56th Annual Grammy Awards. "Get Lucky" was voted the number one song of 2013 in a Digital Spy reader poll. On January 26, 2014, "Get Lucky" reached #3 in Triple J's Hottest 100 of 2013, the world's largest musical democracy. The Village Voice's Pazz & Jop annual critics' poll ranked "Get Lucky" at number one to find the best music of 2013. The aggregation website Acclaimed Music currently ranks "Get Lucky" as the greatest song of 2013, the greatest song of the 2010s decade, and the 55th greatest song of all time. "When I think how it happened, too, with people who I like a lot, that we just decided to go into the studio and do something... And then it turns out like this? It's absolutely remarkable, because no-one was prepared for this! [...] to have this ubiquitous record, that is a hit everywhere... It's amazing to me! I'm out on the road and I can hear it wherever I go. I'm flabbergasted!" In France, "Get Lucky" debuted at number one on the French Singles Chart on 24 April 2013, becoming Daft Punk's first chart-topping single in their home country since "One More Time" in 2000. The song sold 38,887 copies in three days, making "Get Lucky" the best-selling digital single in a one-week period. In Belgium, where two independent official charts are published weekly (one for Flanders, one for Wallonia), "Get Lucky" entered in the top position on both charts, making it Daft Punk's highest Belgian chart entry ever and their first No. 1 song in the country. In the United Kingdom, "Get Lucky" entered the UK Singles Chart at number three on 21 April 2013―only 48 hours after its release—selling more than 50,000 copies and becoming Daft Punk's first top ten hit in the UK since "One More Time" in 2000. The song then peaked at number one the following week, with sales of over 155,000 copies, and became Daft Punk's first ever number one single in Britain. The song remained in the top position during the following week, selling over 163,000. "Get Lucky" remained atop the chart for a third and fourth consecutive week, selling over 100,000 copies within each of them. By late May 2013, over 600,000 copies of the song had been sold in just over four weeks and sales had exceeded those of Macklemore and Ryan Lewis' "Thrift Shop", making "Get Lucky" the country's best-selling single of the year thus far. On 27 June, the Official Charts Company announced that "Get Lucky" had sold over a million copies in the UK; only the 136th single and first released in 2013 to do so. The song was the first involving Daft Punk, Williams or Rodgers to achieve this feat as well as being the second by a French act (after David Guetta's "Titanium"). Both Martin Talbot, chief executive of the Official Charts Company, and Rodgers were impressed by the quick time (69 days) the single took to cross the million sales barrier. It was the second best-selling song in the UK in 2013, with sales of over 1,308,000, and the most streamed track of 2013 in the UK. As of June 2015, "Get Lucky" has sold 1,436,000 copies in the UK, making it the sixth best-selling single of the 2010s and the eighth best-selling single of the century. In the United States, the song debuted at number five on the Billboard Dance/Electronic Songs chart for the week ending 4 May 2013. By the week ending 25 May, the song had reached the number 2 position and its peak position of number one was eventually reached during the week ending of 1 June 2013 remaining on top for 13 weeks. The song debuted at number 19 on the Billboard Hot 100 on 24 April 2013, selling 113,000 downloads—this placement resulted in the song becoming the duo's first ever top 40 hit on the chart. "Get Lucky" eventually peaked at number two on the Billboard Hot 100 for five weeks, behind Robin Thicke's "Blurred Lines" featuring T.I. and Williams. Since both songs feature Williams, he became the first artist to simultaneously occupy the top two slots of the Billboard Hot 100 chart since 2009, when The Black Eyed Peas achieved the same feat. "Get Lucky" also reached the number one position on the Hot Dance Club Songs chart, their first song to achieve this feat since "Face to Face" in 2004. As of April 2014, the song has sold over 3,475,000 copies in the United States, the most for any Daft Punk song. In Australia, "Get Lucky" debuted at number two on the ARIA Singles Chart on the week ending 5 May 2013. The song is Daft Punk's highest-placing entry on the chart since "One More Time" peaked at number 10 in April 2001. The song attained the top position on the ARIA chart in the second week after its release. The song reached number one on the week ending of 19 May and remained at the position for two more weeks. Besides appearing at 2013 MTV Video Music Awards, Daft Punk, Williams, and Rodgers were nominated for Best Song of the Summer, but lost by a very large margin to One Direction's "Best Song Ever". (2015) "Little Red Riding Hood"
Numerous cover versions of "Get Lucky" have been published since the single's release. In April 2013, English folk band Daughter recorded an indie version of the song for BBC Radio 1's Live Lounge. In the same month, Dutch reggae and hip hop band the Postmen recorded an English-language version for Giel Beelen's program on the 3FM radio station. Israeli musician Noy Alooshe made a mashup of the song with Michael Jackson's "Billie Jean". The song was also covered by George Barnett, Postmen, Igor Presnyakov, The Stepkids, Sam Sparro and Skylar Grey. In May 2013, Peter Serafinowicz uploaded a video of him, featuring the song. The same month, English bands Peace and the Mystery Jets performed the song together during a concert. Australian band San Cisco recorded a cover version for the radio station Triple J, incorporating slap bass and bongo drums as well as elements of the N.E.R.D song "Hypnotize U". Joe McElderry has performed the song a number of times at his gigs, the first being at London's Pizza Express Jazz Club on May 28. On The Voice, Tom Jones, Jessie J, will.i.am and Danny O'Donoghue sang the song. The song was covered by British record producer Naughty Boy, for his debut album Hotel Cabana; it features as a bonus track with vocals by Tanika. In June 2013, The Roots covered the song as fictional duo "Black Simon & Garfunkel" on Late Night with Jimmy Fallon. Wilco performed a version at the opening night of the Solid Sound Festival in North Adams, Massachusetts, U.S. on June 21, 2013, In July 2013, Florence Welch sang the song in London. Arié Elmaleh, brother of Gad Elmaleh, performed an adapted Dutch version on Le Grand Journal in August 2013. In the same month a Jewish Orthodox organization Aish HaTorah published a Rosh Hashanah's ("Jewish New Year") version of this song, called "Get Clarity". Comedians Simon Pegg and Nick Frost did a humorous version on Capital FM radio. In September 2013, Fall Out Boy performed the song during a concert in Uncasville, Connecticut. A reggae cover version was released by Antiguan singer Asher Otto and her band Itchyfeet. Rock band Halestorm recorded a cover for their EP ReAniMate 2.0. Rapper Kellee Maize recorded a cover and remix of and created a video for the song entitled "Do Something". The a cappella group Pentatonix covered the song as part of their tribute to Daft Punk, entitled "Daft Punk", for their extended play album PTX, Vol. II. The Russian Interior Ministry choir performed a version of the song in concert in November 2013, and then reprised their performance for the opening ceremonies of the 2014 Winter Olympics in Sochi. In the third series of The Voice, the song was sung by contestant Anna McLuckie, who also played the harp to the song. This video on YouTube went viral, with over four million views. In February 2014, Pomplamoose released a Williams-themed cover medley combining "Get Lucky", Daft Punk's "Lose Yourself to Dance" and Williams' "Happy". Russkaja, covered the song for their 2013 EP 'Barada'. "Weird Al" Yankovic recorded a cover of "Get Lucky" as part of his polka medley "NOW That's What I Call Polka!" for his 2014 album Mandatory Fun. The band Walk off the Earth later recorded a cover version of "Get Lucky" with an accompanying video. In 2015, a cover of the song was released as the debut single by Russian 11-year-old child singer Alisa Kozhikina, the winner of the first season of the Voice Kids Russia (2014) and the Russian representative at the 2014 Junior Eurovision Song Contest. Credits adapted from Random Access Memories liner notes. 1 2 "Daft Punk Tease New Album at Coachella, During 'Saturday Night Live', Reveal Guests". Billboard. 14 April 2013. Retrieved 14 April 2013. Random Access Memories was recorded in Paris, L.A. and New York and is slated to include a second Pharrell-sung track called 'Lose Yourself to Dance', according to Rolling Stone. 1 2 3 4 5 6 Cubarrubia, RJ (15 April 2013). "Pharrell: Daft Punk 'Not Bound by Time and Space'" (YouTube video). Rolling Stone. Retrieved 15 April 2013. 1 2 3 Blistein, Jon (11 April 2013). "Nile Rodgers: New Daft Punk Album 'Went Back to Go Forward'" (YouTube video). Rolling Stone. Retrieved 11 April 2013. 1 2 Montgomery, James (18 April 2013). "Daft Punk's 'Get Lucky' Gets Very Specific Release Date". MTV News. Retrieved 18 April 2013. Spokesperson for Columbia Records confirms to MTV News band's single will be released Friday at 12:01 a.m. ET. 1 2 Cragg, Michael (19 April 2013). "Daft Punk: Get Lucky feat Pharrell Williams – review". The Guardian. Retrieved 21 April 2013. 1 2 Beta, Andy (19 April 2013). "Daft Punk: "Get Lucky" [ft. Pharrell]". Pitchfork Media. Retrieved 19 April 2013. (...) "Get Lucky"'s real elegance lies in the hands of Nile Rodgers, which is no doubt the Robots' intent. (...) The vocodered break from Daft Punk thrills as well, but Rodgers is the reason that ten seconds of "Get Lucky" could dilate into minutes and hours of pleasure without tedium ever settling in. 1 2 Corner, Lawrence (18 April 2013). "Daft Punk ft. Pharrell, Nile Rodgers: 'Get Lucky' – Single review". Digital Spy. Retrieved 21 April 2013. 1 2 Dombal, Ryan (May 14, 2013). "Cover Story: Daft Punk". Pitchfork Media. Retrieved May 14, 2013. ↑ Martin, Lauren (May 13, 2013). "Nile Rodgers' Top Five Daft Punk Tracks". Dazed & Confused. dazeddigital.com. Retrieved May 13, 2013. 1 2 Manouvere, Philippe (May 2013). "En couverture: Daft Punk". Rock & Folk (in French). Editions Larivière (549): 74–81. 1 2 Nile Rodgers interview: 'Daft Punk and I were on unified plane of grooviness' The Daily Telegraph. Retrieved August 1, 2013. 1 2 Tong, Pete (May 10, 2013). "Daft Punk Speak To Pete Tong". BBC Radio 1. YouTube. Retrieved May 10, 2013. ↑ Icons: Mick Guzauski on Engineering and Mixing Daft Punk’s Random Access Memories. sonicscoop.com. Retrieved January 29, 2014. ↑ Random Access Memories (liner notes). Daft Punk. Columbia Records, a division of Sony Music Entertainment. 2013. ↑ Weiner, Jonah (21 May 2013). "Daft Punk: All Hail Our Robot Overlords". Rolling Stone. Retrieved 21 May 2013. ↑ Daft Punk "Get Lucky" Sheet Music - Download & Print. musicnotes.com. Accessed from July 18, 2013. ↑ Get Lucky Sheet Music. Nathan East on Instagram. Retrieved January 21, 2013. ↑ Tingen, Paul (July 2013). "SOS Interview: Recording Random Access Memories". Sound on Sound (USA). 28 (9). ↑ "Good Times" with Nile Rodgers, Part 1, Good Day New York. myfoxny.com. Retrieved August 6, 2013. "08:28 - the way that 'Get Lucky' happened was [...] they asked me specifically, 'How did you make Chic records in the old days?' [...] In those days [...] we were limited by technology. So I said, 'I do this part first [guitar melody] and then I play the other part on top of it.' [guitar strumming gesture]"
↑ Omar Hakim on Daft Punk's "Get Lucky" Explanation and Drum Demonstration. Modern Drummer, YouTube. Retrieved June 27, 2014. ↑ "Get Lucky" - 1LIVE Chilly Gonzales - Pop Music Masterclass. YouTube. Retrieved 10 April 2014. ↑ David Blot, La Sélection de Daft Punk (French). novaplanet.com. Retrieved August 20, 2013. ↑ "Daft Punk and Stevie Wonder Lead Funky Disco Smash-Up at Grammys". Rolling Stone. 26 January 2014. ↑ Swift, Patrick (21 April 2013). "Pharrell Performs 'Get Lucky' Three Times In NYC". Mixmag. Development Hell. Retrieved 21 April 2013. ↑ pvnova (10 June 2013). "Evolution of Get Lucky [Daft Punk Chronologic cover by PV NOVA]" (Audio upload). YouTube. Retrieved 28 June 2013. ↑ TheBeatmaniacTBM (16 April 2013). "Daft Punk and Pharrell Williams - Get Lucky (Official TBM remix)" (Video upload). YouTube. Retrieved 28 June 2013. ↑ Brian Anthony Hernandez (27 June 2013). "Listen to Daft Punk's 10-Minute 'Get Lucky' Remix". Mashable. Retrieved 28 June 2013. ↑ Forrest Wickman (21 June 2013). "Random Access Memories Gets Remixed". Slate. The Slate Group, LLC. Retrieved 28 June 2013. ↑ Kyle McGovern (11 March 2013). "Nicolas Jaar's Grizzly Bear, Brian Eno Remixes Pressed as Record Store Day Exclusive". Spin. SpinMedia. Retrieved 28 June 2013. ↑ Helmore, Edward (27 April 2013). "Disco's back as Nile Rodgers tops chart again – with help from his French friends". The Observer. Retrieved 22 June 2013. ↑ Lachman, Ed (August 15, 2013). "Exclusive: Nile Rodgers On Shooting Videos For Daft Punk, Collaborating With David Guetta, Avicii". Vibe. Retrieved August 16, 2013. ↑ Arellano, Jennifer (3 December 2013). "Best of 2013 (Behind the Scenes): Stephen Colbert on how he got 'lucky' with his celeb-studded Daft Punk dance video". Entertainment Weekly. Retrieved 4 December 2013. ↑ Frere-Jones, Sasha (27 May 2013). "Sasha Frere-Jones: Daft Punk's Puzzling New Album". The New Yorker. Retrieved 27 May 2013. ↑ "Get Lucky – Song Reviews". Rolling Stone. 19 April 2013. Retrieved 3 June 2013. ↑ Sciarretto, Amy (19 April 2013). "Daft Punk, 'Get Lucky' Feat. Pharrell Williams + Nile Rodgers – Song Review". PopCrush. Retrieved 3 June 2013. ↑ Rigby, Sam (27 April 2013). "Fatboy Slim: 'Daft Punk have given dance music a kick up the arse'". Digital Spy. Retrieved 28 April 2013. ↑ Rigby, Sam (20 April 2013). "Daft Punk's 'Get Lucky' breaks Spotify streaming records". Digital Spy. Retrieved 21 April 2013. ↑ Best Song of the Summer 2013 MTV Video Music Awards. mtv.com. Retrieved August 18, 2013. ↑ Nissim, Mayer (24 December 2013). "Daft Punk, Katy Perry voted best music of 2013 in DS readers' poll". DigitalSpy. National Magazine Company Ltd. Retrieved 28 December 2013. 1 2 3 4 Lane, Daniel (27 June 2013). "Daft Punk's Get Lucky becomes one of the UK's biggest selling singles of all-time!". Official Charts Company. Retrieved 27 June 2013. ↑ Decant, Charles (21 April 2013). "France: Daft Punk pulvérise le record de ventes digitales avec "Get Lucky"" (in French). Charts in France. Retrieved 24 April 2013. ↑ Kreisler, Lauren (21 April 2013). "Daft Punk Get Lucky with Top 3 placing after only 48 hours on sale". Official Charts Company. Retrieved 21 April 2013. ↑ Kreisler, Lauren (28 April 2013). "Daft Punk groove their way to first-ever UK number 1 with Get Lucky". Official Charts Company. Retrieved 14 May 2013. ↑ Lane, Daniel (15 May 2013). "Daft Punk's Get Lucky breaks half a million sales". Official Charts Company. Retrieved 15 May 2013. ↑ Kreisler, Lauren (12 May 2013). "Daft Punk blast through 100,000 sales barrier for third week running". Official Charts Company. Retrieved 13 May 2013. ↑ Kreisler, Lauren (5 May 2013). "Get Lucky becomes Daft Punk's biggest hit of Daft Punk's career". Official Charts Company. Retrieved 13 May 2013. ↑ "Daft Punk's Get Lucky already second biggest selling single of the year!". Official Charts Company. 19 May 2013. Retrieved 27 February 2014. ↑ Lane, Daniel (22 May 2013). "Daft Punk set for fastest selling album of 2013 with Random Access Memories". Official Charts Company. Retrieved 22 May 2013. ...lead single, Get Lucky, today becomes the UK’s biggest selling single of 2013 so far.…has sold a staggering 649,000 copies in just over 5 weeks. 1 2 3 "Daft Punk's Get Lucky becomes first million-seller released in 2013". The Guardian. 28 June 2013. Retrieved 28 June 2013. ↑ "Official Charts Analysis: Pharrell Williams hits No.1 with 106k sales". Music Week. December 29, 2013. ↑ Daniel Lane (January 1, 2014). "The Official Top 40 Biggest Selling Singles Of 2013". Official Charts Company. ↑ "The Official Top 40 Most Streamed Songs Of 2013". Officialcharts.com. Retrieved 2014-04-10. 1 2 3 Moss, Liv (19 June 2015). "Official Biggest Selling Singles of the decade so far revealed". Official Charts Company. Retrieved 9 September 2015. ↑ Copsey, Rob (11 June 2015). "The Official Top 40 Biggest Selling Singles of the Millennium so far revealed". Official Charts Company. Retrieved 9 September 2015. ↑ "Dance/Electronic Songs – May 4, 2013". Billboard. Retrieved 23 May 2013. ↑ "Dance/Electronic Songs – May 25, 2013". Billboard. Retrieved 23 May 2013. ↑ "Dance/Electronic Songs – June 1, 2013". Billboard. Retrieved 23 May 2013. 1 2 Trust, Gary (24 April 2013). "P!nk Remains Atop Hot 100, PSY Enters Top 10". Billboard. Retrieved 22 May 2013. ↑ Trust, Gary (22 May 2013). "'Can't' Stop Macklemore & Ryan Lewis Atop Hot 100". Billboard. Retrieved 22 May 2013. ↑ Trust, Gary (19 June 2013). "Robin Thicke's 'Blurred Lines' Remains Atop Hot 100 Chart". Billboard. Retrieved 19 June 2013. ↑ Trust, Gary (29 May 2013). "Macklemore & Ryan Lewis Still Atop Hot 100, Zach Sobiech Debuts". Billboard. Retrieved 22 May 2013. 1 2 Grein, Paul (April 16, 2014). "Chart Watch: "Happy" tops 4M". Yahoo! Music. Yahoo!. 1 2 Alexey Mazhaev (InterMedia) (2015-04-15). Алиса Кожикина - "Get Lucky" *** (in Russian). InterMedia. Retrieved 2016-05-27. ↑ ohdaughter (28 April 2013). "Daughter - "Get Lucky" (Daft Punk cover)" (Audio upload). YouTube. Retrieved 28 June 2013. ↑ Makarechi, Kia (29 April 2013). "Daughter's 'Get Lucky' Cover Makes Daft Punk's Single A Rainy Day Jam (AUDIO)". The Huffington Post. Retrieved 4 May 2013. ↑ TopNotchNL (27 April 2013). "Postmen - Get Lucky @ Giel 3FM (Daft Punk & Pharrell Wiliams Cover)" (Video upload). YouTube. Retrieved 28 June 2013. 1 2 "Our 8 Favourite Cover Versions Of Daft Punk's 'Get Lucky'... So Far (VIDEO)". The Huffington Post. 7 May 2013. Retrieved 13 May 2013. ↑ "'Get Lucky' – Daft Punk ft. Pharrell Williams & Nile Rodgers (The Stepkids' Cover)". ↑ O'Neil, Luke (27 September 2013). "Skylar Grey Gets Really, Really, Really Ridiculously Lucky In Her Daft Punk Cover Video". MTV. Retrieved 29 September 2013. ↑ Colis, Clark (3 May 2013). "British comedian (and voice of Darth Maul) Peter Serafinowicz posts hilarious clip for Daft Punk's 'Get Lucky'". Entertainment Weekly. Retrieved 4 May 2013. ↑ "Peace and Mystery Jets cover Daft Punk's 'Get Lucky' at London's Birthdays (May 3)". NME. 4 May 2013. Retrieved 12 September 2013. ↑ "San Cisco Mash Daft Punk And N*E*R*D For 'Like A Version'". Music Feeds. 31 May 2013. Retrieved 31 May 2013. ↑ triplejtv (30 May 2013). "San Cisco cover Daft Punk 'Get Lucky' on triple j" (Video upload). YouTube. Retrieved 31 May 2013. ↑ "Joe McElderry covers Daft Punk's 'Get Lucky' - watch". Digital Spy. 2013-05-31. Retrieved 2014-04-10. ↑ "iTunes Music – Hotel Cabana by Naughty Boy". iTunes Store. ↑ Williott, Carl (20 June 2013). "Watch The Roots Cover Daft Punk's "Get Lucky" In The Style Of Simon & Garfunkel". Idolator. Retrieved 12 September 2013. ↑ Alex Young (22 June 2013). "Watch Wilco cover Daft Punk, The Replacements, and Pavement". Consequence Of Sound. Retrieved 28 June 2013. ↑ Reilly, Dan (22 July 2013). "Watch Florence Welch Pound Tequila and Sing Daft Punk". Spin. Retrieved 12 September 2013. ↑ Orozco, Edouard (27 August 2013). "Le Grand Journal : la séquence d'Arié Elmaleh inspirée par Jimmy Fallon ?". Premiere (in French). Retrieved 12 September 2013. ↑ "'Get Lucky' — Rosh Hashanah version". The Times of Israel. 2013-09-02. Retrieved 29 December 2013. ↑ Rawden, Jessica (August 29, 2013). "Watch Simon Pegg And Nick Frost Cover Daft Punk's Get Lucky". Cinema Blend. Retrieved September 20, 2013. ↑ "Fall Out Boy cover Daft Punk's 'Get Lucky' live - watch". NME. 6 September 2013. Retrieved 12 September 2013. ↑ "Daft Punk - Get Lucky (Asher Otto & Itchyfeet Cover)" (Video upload). YouTube. 26 June 2013. Retrieved 20 October 2013. ↑ Kielty, Martin (24 September 2013). "Halestorm cover Daft Punk". TeamRock Radio. Retrieved 29 September 2013. ↑ "Daft Punk - Get Lucky Remix & Cover by Kellee Maize". 18 May 2013. ↑ "Pentatonix Covers Daft Punk Hits in Stunning A Cappella Medley". Retrieved 5 November 2013. ↑ The next video begins in 10 seconds. "NBC Olympics". NBC Olympics. Retrieved 2014-04-10. ↑ "Teen Harpist Playing Daft Punk's 'Get Lucky' Is Unlike Anything You've Heard Before (VIDEO)". The Huffington Post. 23 January 2014. Retrieved 17 April 2014. ↑ "Алиса Кожикина выпустила дебютный сингл — Вокруг ТВ." (in Russian). 2015-04-13. Retrieved 2016-05-26. ↑ Random Access Memories (liner notes). Daft Punk. Columbia Records. 2013. 1 2 "Get Lucky (Radio Edit) [feat. Pharrell Williams] – Single by Daft Punk". iTunes Store (UK). Apple. Retrieved 19 April 2013. 1 2 "Get Lucky". Amazon.com. Retrieved 23 June 2013. ↑ "iTunes - Music - Get Lucky (feat. Pharrell Williams & Nile Rodgers) [Daft Punk Remix] - EP by Daft Punk". iTunes Store. 2013-07-03. Retrieved 2014-04-10. ↑ "Australian-charts.com – Daft Punk feat. Pharrell Williams – Get Lucky". ARIA Top 50 Singles. Retrieved 16 May 2013. ↑ "Austriancharts.at – Daft Punk feat. Pharrell Williams – Get Lucky" (in German). Ö3 Austria Top 40. Retrieved 29 May 2013. ↑ "Ultratop.be – Daft Punk feat. Pharrell Williams – Get Lucky" (in Dutch). Ultratop 50. Retrieved 16 May 2013. ↑ "Ultratop.be – Daft Punk feat. Pharrell Williams – Get Lucky" (in French). Ultratop 50. Retrieved 16 May 2013. 1 2 BPP, ed. (August 2013). "Billboard Brasil Hot 100 Airplay". Billboard Brasil (43): 88. ↑ "Daft Punk – Chart history" Canadian Hot 100 for Daft Punk. Retrieved 16 May 2013. ↑ "National Report – Top Nacional" (in Spanish). National Report. 2013-06-23. Archived from the original on 2013-06-24. ↑ "ČNS IFPI" (in Czech). Hitparáda – Radio Top 100 Oficiální. IFPI Czech Republic. Note: insert 201336 into search. ↑ "ČNS IFPI" (in Czech). Hitparáda – Digital Top 100 Oficiální. IFPI Czech Republic. Note: insert 201418 into search. Retrieved 2 July 2014. ↑ "Danishcharts.com – Daft Punk feat. Pharrell Williams – Get Lucky". Tracklisten. Retrieved 16 May 2013. ↑ "Daft Punk – Chart history" Billboard Euro Digital Songs for Daft Punk. ↑ "Daft Punk: Get Lucky (Feat. Pharrell Williams)" (in Finnish). Musiikkituottajat – IFPI Finland. Retrieved 16 May 2013. ↑ "Lescharts.com – Daft Punk feat. Pharrell Williams – Get Lucky" (in French). Les classement single. Retrieved 16 May 2013. ↑ "Offiziellecharts.de – Daft Punk feat. Pharrell Williams – Get Lucky". GfK Entertainment Charts. Retrieved 16 May 2013. ↑ "Digital Singles Charts – Greece". Billboard. ↑ "Archívum – Slágerlisták – MAHASZ" (in Hungarian). Dance Top 40 lista. Magyar Hanglemezkiadók Szövetsége. Retrieved 3 July 2013. ↑ "Archívum – Slágerlisták – MAHASZ" (in Hungarian). Rádiós Top 40 játszási lista. Magyar Hanglemezkiadók Szövetsége. Retrieved 15 May 2013. ↑ "Archívum – Slágerlisták – MAHASZ" (in Hungarian). Single (track) Top 40 lista. Magyar Hanglemezkiadók Szövetsége. Retrieved 6 February 2014. ↑ "Chart Track: Week 17, 2013". Irish Singles Chart. Retrieved 26 April 2013. ↑ "Daft Punk feat. Pharrell Williams – Get Lucky Media Forest". Israeli Airplay Chart. Media Forest. Retrieved 16 May 2013. ↑ "Italiancharts.com – Daft Punk feat. Pharrell Williams – Get Lucky". Top Digital Download. Retrieved 16 May 2013. ↑ "Daft Punk - Chart History". Billboard (in Japanese). Retrieved May 31, 2013. ↑ "Daft Punk – Chart history" Billboard Luxembourg Digital Songs for Daft Punk. Retrieved 16 May 2013. ↑ "Top 20 General Del 17 Al 23 de Junio del 2013". Monitor Latino (in Spanish). RadioNotas. 23 June 2013. Retrieved 26 June 2013. ↑ "Mexico Ingles Airplay". Billboard. ↑ "Nederlandse Top 40 – Daft Punk feat. Pharrell Williams search results" (in Dutch) Dutch Top 40. Retrieved 16 May 2013. ↑ "Dutchcharts.nl – Daft Punk feat. Pharrell Williams – Get Lucky" (in Dutch). Single Top 100. Retrieved 12 July 2013. ↑ "Charts.org.nz – Daft Punk feat. Pharrell Williams – Get Lucky". Top 40 Singles. Retrieved 16 May 2013. ↑ "Norwegiancharts.com – Daft Punk feat. Pharrell Williams – Get Lucky". VG-lista. Retrieved 16 May 2013. ↑ "Listy bestsellerów, wyróżnienia :: Związek Producentów Audio-Video". Polish Airplay Top 100. Retrieved July 15, 2013. ↑ "Listy bestsellerów, wyróżnienia :: Związek Producentów Audio-Video". Polish Dance Top 50. Retrieved July 26, 2013. ↑ "Portugal Digital Songs – Peak". Billboard. Retrieved 19 May 2013. ↑ "Media Forest - Weekly Charts" (in Romanian). Retrieved 1 July 2013. ↑ "Archive Chart: 2013-05-04". Scottish Singles Top 40. Retrieved April 21, 2013. ↑ "SNS IFPI" (in Slovak). Hitparáda – Radio Top 100 Oficiálna. IFPI Czech Republic. Note: insert 201335 into search. ↑ "SNS IFPI" (in Slovak). Hitparáda – Singles Digital Top 100 Oficiálna. IFPI Czech Republic. Note: insert 201430 into search. Retrieved July 29, 2014. ↑ "SloTop50 - Slovenian official singles chart". slotop50.si. Retrieved 5 June 2015. ↑ "EMA Top 10 Airplay: Week Ending 2013-07-16". Entertainment Monitoring Africa. Retrieved April 26, 2014. ↑ "South Korea Gaon International Chart (Gaon Chart)". Gaon Chart. Retrieved 9 May 2013. ↑ "Spanishcharts.com – Daft Punk feat. Pharrell Williams – Get Lucky" Canciones Top 50. Retrieved 23 May 2013. ↑ "Swedishcharts.com – Daft Punk feat. Pharrell Williams – Get Lucky". Singles Top 100. Retrieved 16 May 2013. ↑ "Swisscharts.com – Daft Punk feat. Pharrell Williams – Get Lucky". Swiss Singles Chart. Retrieved 16 May 2013. ↑ "Archive Chart: 2013-05-04" UK Singles Chart. Retrieved 16 May 2013. ↑ "Archive Chart: 2013-05-04" UK Dance Chart. Retrieved 16 May 2013. ↑ "Daft Punk – Chart history" Billboard Hot 100 for Daft Punk. Retrieved 16 May 2013. ↑ "Daft Punk – Chart history" Billboard Adult Contemporary for Daft Punk. Retrieved 29 July 2013. ↑ "Daft Punk – Chart history" Billboard Adult Pop Songs for Daft Punk. Retrieved 25 July 2013. ↑ "Daft Punk – Chart history" Billboard Hot Dance Club Songs for Daft Punk. Retrieved 23 May 2013. ↑ "Daft Punk – Chart history" Billboard Dance/Mix Show Airplay for Daft Punk. Retrieved 23 May 2013. ↑ "Daft Punk – Chart history" Billboard Hot Dance/Electronic Songs for Daft Punk. Retrieved 16 May 2013. ↑ "Daft Punk – Chart history" Billboard Latin Pop Songs for Daft Punk. Retrieved 4 June 2014. ↑ "Daft Punk – Chart history" Billboard Pop Songs for Daft Punk. Retrieved 13 June 2013. ↑ "Daft Punk – Chart history" Billboard R&B/Hip-Hop Airplay for Daft Punk. Retrieved 12 July 2014. ↑ "Daft Punk – Chart history" Billboard Rhythmic Songs for Daft Punk. Retrieved 4 June 2014. ↑ "Daft Punk – Chart history" Billboard Rock Airplay for Daft Punk. Retrieved 4 June 2014. ↑ "Pop Rock General". Record Report (in Spanish). R.R. Digital C.A. 18 May 2013. Archived from the original on 18 May 2013. Retrieved 18 May 2013. ↑ "2013 Year End Singles Chart". ARIA. Retrieved 2013-02-07. ↑ "Best of 2013: Canadian Hot 100". Prometheus Gobal Media. Retrieved December 13, 2013. ↑ "France : Qui a vendu le plus de singles en 2013 à ce jour ?". Ozap.com. Retrieved 2014-04-10. ↑ "Top 100 Singles Jahrescharts 2013" (in German). VIVA. Viacom International Media Networks. Retrieved 12 January 2014. ↑ "MAHASZ Rádiós TOP 100 - radios 2013" (in Hungarian). MAHASZ. Retrieved January 22, 2014. ↑ "The World's #1 Music Discovery, Rating, and Purchasing Experience!". Mediaforest.biz. Retrieved 2014-04-10. ↑ "FIMI - Federazione Industria Musicale Italiana - Primo piano". Fimi.it. Retrieved 2014-04-10. ↑ "Japan Hot 100 | Billboard Chart Archive". Billboard. Retrieved 2014-07-11. ↑ Steffen Hung. "Dutch charts portal". dutchcharts.nl. Retrieved 2014-04-10. ↑ "Top Selling Singles of 2013". Recorded Music NZ. Retrieved 1 January 2015. ↑ "promusicae lists" (in Spanish). promusicae. Retrieved 3 February 2014. ↑ "The Official Top 40 Biggest Selling Singles Of 2013". Officialcharts.com. Retrieved 2014-04-10. ↑ "Best of 2013 - Hot 100 Songs". Retrieved December 13, 2013. ↑ "Alternative Songs: Year End 2013". Billboard. Retrieved 21 December 2014. ↑ "Dance Club Songs – Year End 2013". Billboard. Retrieved December 19, 2014. ↑ "Pop Songs – Year End 2013". Billboard. Retrieved December 19, 2014. ↑ "Rock Airplay Songs: Year End 2013". Billboard. Retrieved 21 December 2014. ↑ "Ultratop − Goud en Platina – 2014". Ultratop & Hung Medien / hitparade.ch. ↑ "Canadian single certifications – Daft Punk – Get Lucky". Music Canada. ↑ "Certificeringer". International Federation of the Phonographic Industry. Retrieved 7 September 2014. 1 2 "Daft Punk" (in Finnish). Musiikkituottajat – IFPI Finland. ↑ "Certifications Single - Year 2013" (PDF) (PDF) (in French). Syndicat National de l'Édition Phonographique. Retrieved March 5, 2014. ↑ "Gold-/Platin-Datenbank (Daft Punk; 'Get Lucky')" (in German). Bundesverband Musikindustrie. Retrieved July 4, 2013. ↑ "Italian Music Certifications" (PDF). FIMI. Retrieved May 31, 2013. ↑ "..:Certificaciones Mensuales 2015:..". Asociación Mexicana de Productores de Fonogramas y Videogramas. Facebook. 15 June 2015. Retrieved 15 June 2015. ↑ "NZ Top 40 Singles Chart - 26 August 2013". Recorded Music NZ. Retrieved 24 August 2013. ↑ "Troféoversikt" (in Norwegian). IFPI Norway. Retrieved September 7, 2014. ↑ "PROMUSICAE CERT" (PDF) (in Spanish). PROMUSICAE. Retrieved 24 July 2013. ↑ "Veckolista Singlar - Vecka 36, 6 september 2013" (in Swedish). Sverigetopplistan/Swedish Recording Industry Association. Retrieved 24 July 2013. ↑ "The Official Swiss Charts and Music Community: Awards (Daft Punk feat. Pharrell Williams; 'Get Lucky')". IFPI Switzerland. Hung Medien. ↑ "Get Lucky (Radio Edit) [feat. Pharrell Williams] – Single by Daft Punk". iTunes Store (AUS). Apple. Retrieved 19 April 2013. ↑ "Get Lucky (Radio Edit) [feat. Pharrell Williams] – Single". iTunes Store (JPN) (in Japanese). Apple. Retrieved 19 April 2013. ↑ "Get Lucky (Radio Edit) [feat. Pharrell Williams] – Single by Daft Punk". iTunes Store (NZ). Apple. Retrieved 19 April 2013. ↑ "Get Lucky (Radio Edit) [feat. Pharrell Williams] – Single by Daft Punk". iTunes Store (US). Apple. Retrieved 19 April 2013. ↑ "Top 40/M Future Releases". All Access Music Group. Archived from the original on 27 April 2013. Retrieved 27 April 2013. ↑ Hudson, Alex (7 June 2013). "Daft Punk to Drop 10-Minute Remix of 'Get Lucky' on New Vinyl Release". Exclaim!. Retrieved 23 June 2013.